This is part 1 in a new series covering VMware VSAN. Stay tuned for more! VMware VSAN (Virtual SAN) is a new storage offering from VMware, not to be confused with the VMware VSA (Virtual Storage Appliance), which serves a different purpose entirely. VSAN is a scale out storage solution that utilizes the local storage of the ESXi hosts, and presents a single datastore to the cluster. Driven by Storage Profiles, the options for VM performance and redundancy are on a per VM basis. 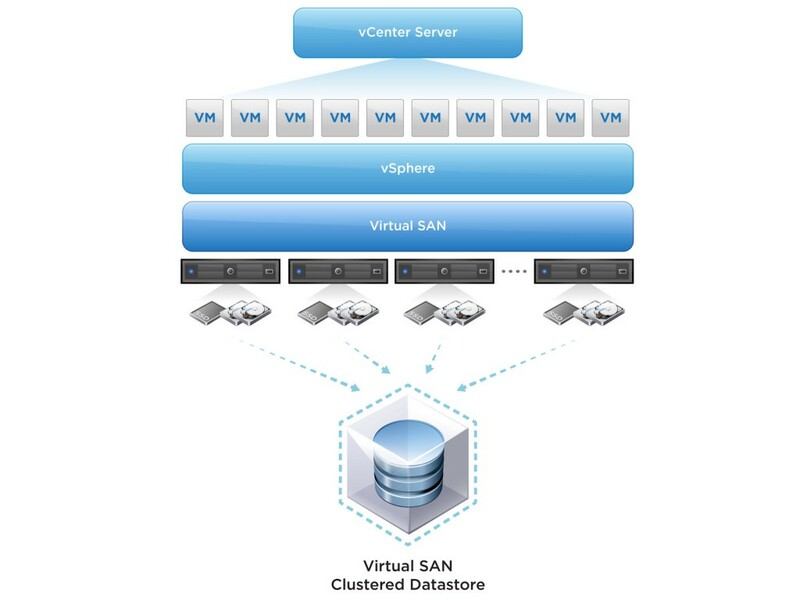 As a high level overview, VMware’s VSAN leverages the local storage of each host and combines it into a single datastore, which is shared amoung all hosts in the cluster. The HDDs are all presented individually to the host. So, you need a controller that supports JBOD or passthrough, so ESXi can see each individual disk. The SSD disks in each disk group is not used for capacity, but is used for cache. 70% for read cache and 30% for write cache. All writes go to the SSD first. VSAN does not leverage RAID, however, it leverages RAIN (Redundant Array of Independent Nodes). By using variables defined in our storage profiles, we can assign each VM to withstand 1 or more disk failures, or 1 or more host failures, ensuring redundancy and uptime. The storage profiles will also allow us to define the number of HDDs that the VM will reside on. By striping the VM accross multiple HDDs, we can increase performance for data that doesn’t currently reside in read cache. Policy-based management streamlines storage provisioning and ongoing administration, automatically maintaining specified storage capacity, performance and availability levels for each virtual machine. Maintain specified storage capacity, performance and availability levels for each individual virtual machine automatically and non-disruptively. Virtual SAN lets you quickly provision shared storage directly from VMware® vCenter™ during virtual machine creation, automatically aggregating server disks in the cluster. Virtual SAN is tightly integrated with all vCenter features, and it enables direct storage management in vCenter with the same ease as compute. Built into the vSphere kernel for lowest latency, Virtual SAN uses read/write SSD caching in each host and provides intelligent data placement within the cluster. Gain the ability to tolerate multiple disk and node failures, plus an efficient, time-saving break-replace approach to hardware maintenance. Scale on demand by adding hosts on the fly or hot-adding disks to existing server nodes. Leverage inexpensive server disks for shared storage, avoiding the capital expense of specialized hardware. Automate and consolidate storage to get equal or better performance with an efficient converged architecture, yielding significant savings in power, space and cooling expenses.